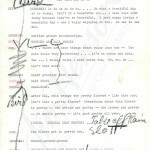 In June 1965, 28-year-old Jim Henson started a written log of his activities in what became known as “The Red Book.” He noted what had happened up until that point (deemed “Ancient History”) and then recorded anything that he felt was worth recording as single line journal entries until the end of 1988. 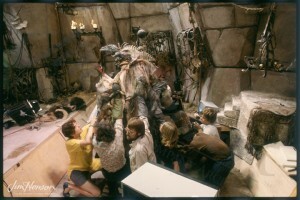 In the post production period for The Dark Crystal, the whole company was busy with ancillary projects. Along with the Clothing Collection that debuted in November 1982 and several exhibits celebrating the artistry of the film, there were numerous publications, licensed products and a documentary in the works. Updates from Jim’s public relations head, Roberta Jimenez, ran to multiple pages, outlining all of these activities along with the international release schedule and an overview of press events. Jim was naturally proud of what he had accomplished, particularly the realization of his dream of creating a whole world. Brian Froud produced a book, The World of The Dark Crystal, featuring his illustrations and text that detailed the creatures, settings and cosmology of The Dark Crystal without dispelling the magic by going behind the scenes on the production. A second book, The Making of The Dark Crystal, with text by Christopher Finch, was strictly about the nuts and bolts of the production, giving voice to the sculptors, designers, costumers, electro-mechanical experts, storyboard artists, performers, producers, and the myriad of other talent that came together to make the film. A storybook, novelization, and comic books followed. In order to best tell his story, Jim was eager to apply the documentary format, enabling him to use his acute visual and aural senses to demonstrate how the creatures were created and performed. After discussions with NET, the public television station, it was decided that an hour long show, The World of The Dark Crystal, would be produced and air on PBS. 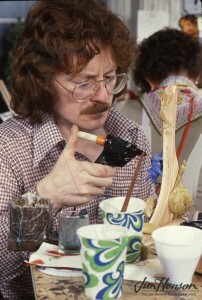 The mind-boggling puppetry was allowed to shine – it was clear that Jim was deeply satisfied to be able to describe the complicated stilt work coupled with safety harnesses and cranes that went into the Landstriders or the intense scrutiny the flora and fauna received in consideration of the larger landscape. Jim also made a point of highlighting Frank Oz’s contributions as his co-director. Their longtime performing partnership allowed for a well-oiled collaboration. 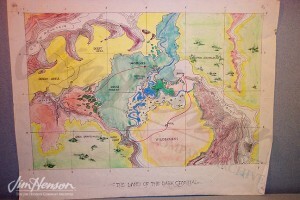 In today’s digital world, documentation of this hand-made feat is an important record of The Dark Crystal’s unique creative process. The World of The Dark Crystal documentary came together over just a couple of months and aired on PBS January 9, 1983, less than a month after the film’s premiere. See inside the World of The Dark Crystal. 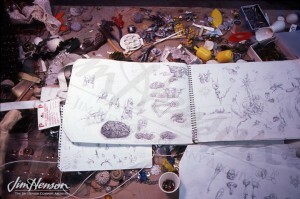 Brian Froud’s sketchbook on a worktable during The Dark Crystal build, 1980. Brian Froud wielding a glue gun during the build of The Dark Crystal, c. 1980. Collaborative puppeteering brings a Skeksis to life during The Dark Crystal shoot, 1981. The map of the land of The Dark Crystal used to plan the action. 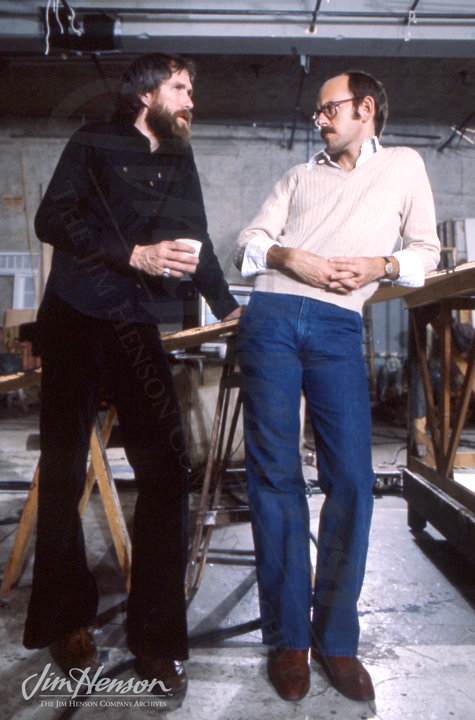 Co-directors Jim Henson and Frank Oz on the set of The Dark Crystal, 1981. Brian Henson, the third of Jim and Jane’s children, was born at a momentous time in Jim’s career. The Hensons had moved to New York at the start of the year to accommodate a schedule of weekly Today Show appearances. That September, Rowlf made his debut on The Jimmy Dean Show, appearing regularly into 1966. 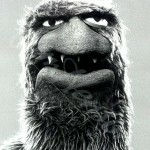 Jim’s advertising work was in high demand, and the Muppets were popular on the variety show circuit. Within a couple months of Brian’s birth, the family of five (plus pets) moved out of Manhattan to Greenwich, CT.
Jim mixed his work and play, having his children to the set where he was shooting, bringing them to puppetry festivals and get togethers with others in the industry, or casting them in some small part. 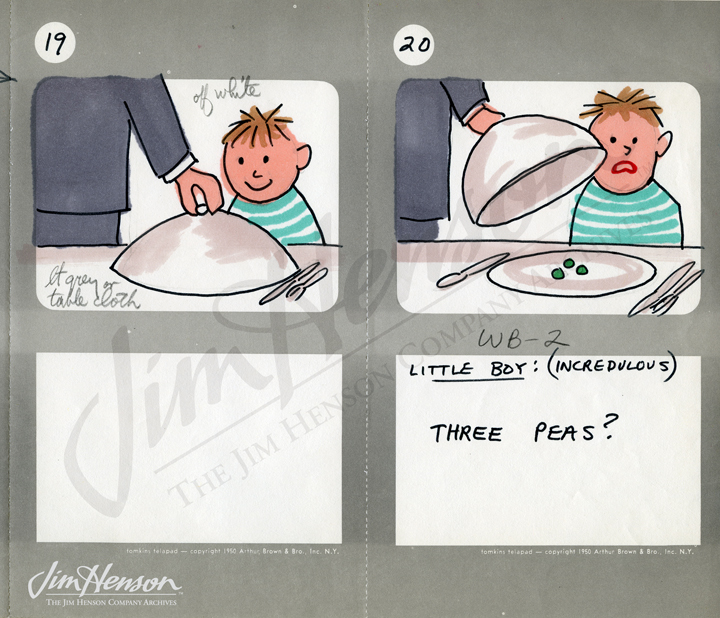 In 1969, Jim had five year old Brian act surprised when being presented with three green peas in the course of a lesson for Sesame Street about the number 3. 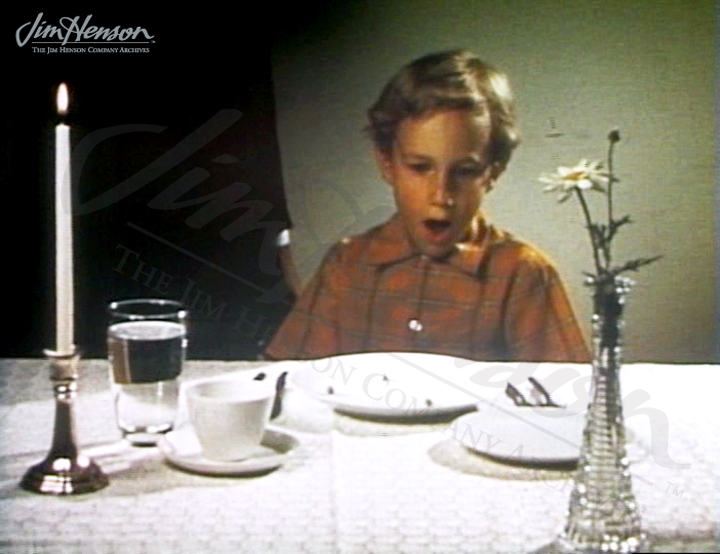 Brian later appeared in a short film with another boy that depicted them mimicking construction vehicles as they ate ice cream. By the time he was 17, Brian had watched his father at work and spent time with his colleagues. 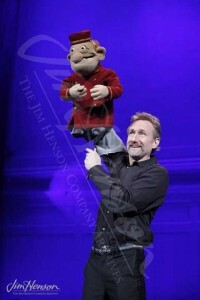 Given real performing responsibility by his father for The Muppets Take Manhattan, Brian discovered a talent for operating a marionette rig, helping Scooter to ride a bicycle. Within a couple years, Brian became indispensable on the sets of his father’s productions. 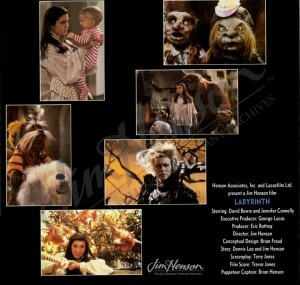 He served as puppet captain for Labyrinth in 1985 while also performing Hoggle with Shari Weiser. He and Kevin Clash held audition workshops to gather puppeteers for The Storyteller, and Brian performed the expressive and curious dog. As a first time director, Brian shaped the Mother Goose Stories television series, and his reputation as a performer led to work on the films Return to Oz, The Witches, Little Shop of Horrors, and Teenage Mutant Ninja Turtles. Having started discussions with Jim before his untimely passing, Brian took the lead on the television series Dinosaurs. 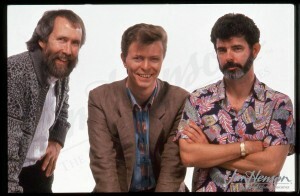 Taking the helm of The Jim Henson Company in 1990, Brian directed and/or produced a wide range of projects including The Muppet Christmas Carol, Muppet Treasure Island, Farscape, Bear in The Big Blue House, Gulliver’s Travels, Muppets Tonight, and “Battleground,” an Emmy Award-winning episode of the Nightmares & Dreamscapes anthology for TBS. Currently, Brian oversees the groundbreaking work at Jim Henson’s Creature Shop, and was part of the team that first created and utilized the Henson Performance Control System, which won an Academy of Motion Picture Arts and Science Scientific and Engineering Award in 1992. 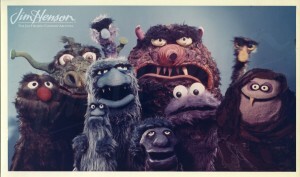 That technology has led to the Henson Digital Puppetry Studio used to create animation in real time. Brian serves as Chairman of The Jim Henson Company and is an executive producer of the PBS KIDS series Dinosaur Train and Sid the Science Kid. With an interest in live theater, he created and launched the improv stage show Puppet Up!Uncensored which is currently touring. He also executive produced and served as a judge for the Syfy Channel’s Creature Shop Challenge and is gearing up for the third season of No, You Shut Up! on the Fusion Channel. 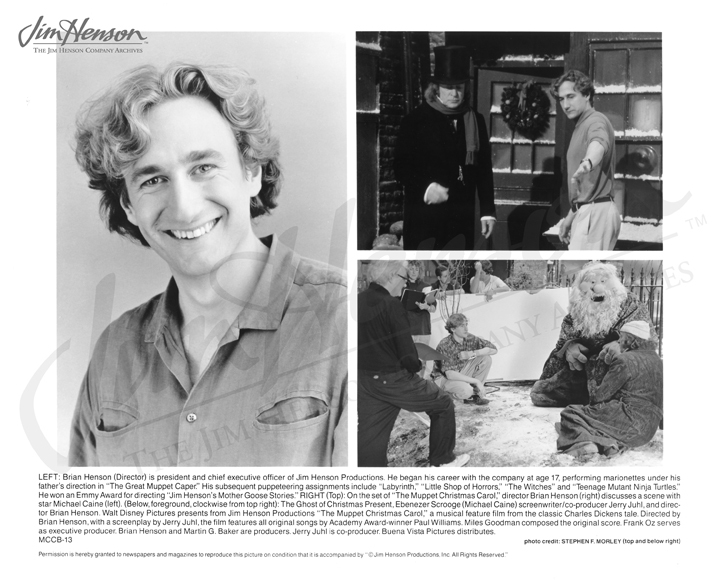 See Brian Henson in the Sesame Street classic Baker Film #3. Brian Henson in the #3 Baker film for Sesame Street, 1969. 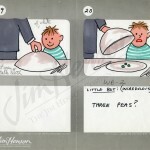 Jim’s storyboard for #3, 1969. 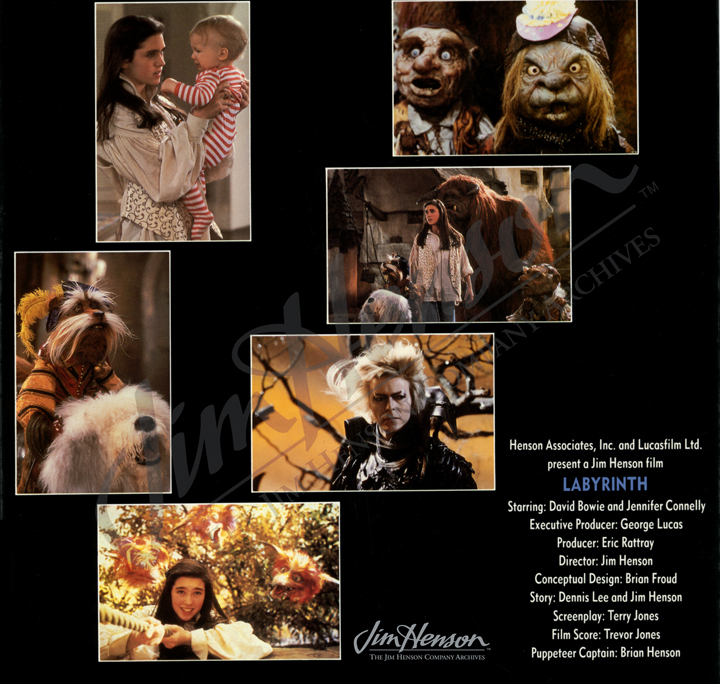 Marketing brochure for Labyrinth. Brian was Puppet Captain, and he performed Hoggle with Shari Weiser. Brian featured in promotional stills for The Muppet Christmas Carol, his feature film directorial debut. Brian performing in the improvisational stage show he created, Stuffed and Unstrung, 2011. With Sesame Street’s production underway in 1969, Jim Henson decided to stop using his Muppet characters to advertise commercial products, instead choosing to have them focus on educating his young Sesame Street viewers. 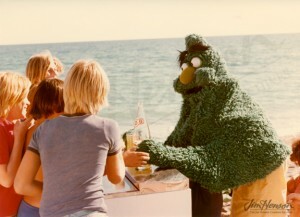 However, throughout the years of Sesame Street’s production, Jim occasionally allowed his Muppets to make appearances in commercials where he felt the situation and product was particularly appropriate. One such product was a soft drink called Mirinda, which was distributed internationally by PepsiCo and, at the time, not available in the United States. Jim agreed to produce commercials for Mirinda because the commercial viewing market was outside of the US. He felt that his young American viewers would not be confused in thinking that a furry monster-like Muppet was trying to sell them soft drinks. Mirinda commercials featured a large green creature with a bright orange nose known as the “Mirinda Craver,” who would do almost anything to drink a Mirinda soda. Four different puppeteers operated the “Craver:” Louise Gold, a British Muppet Show cast member; Bob Payne, principal performer in the commercials who had appeared with Jim as far back as Sam and Friends; Dave Holman, a producer; and Faz Fazakas, known best for rigging mechanical devices to manipulate smaller puppets or puppet parts such as eyes. According to a 1975 production schedule, on October 30th, these puppeteers worked with the production staff to “Pre-light and shoot test for color and Muppet mobility” of the Craven puppet. 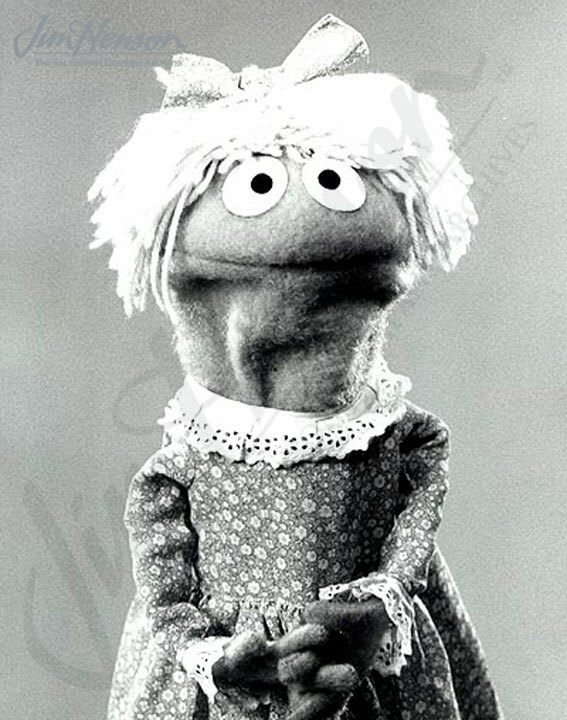 Shooting tests were very important when working with Muppets because the color and texture of the puppets could look quite different on film as compared to how they looked in real life. 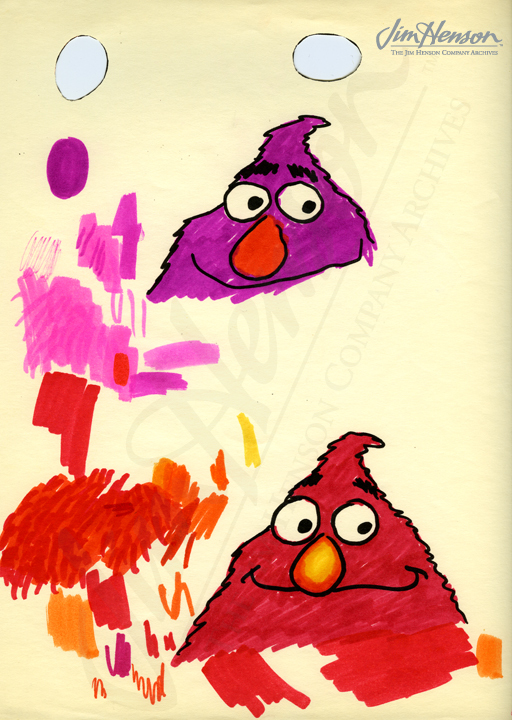 In later shoots, the Craven puppet’s green fur deepened in order to more fully capture the color on film. Between 1975 and 1978, Henson Associates, in collaboration with BBDO, a Madison Avenue advertising powerhouse representing the PepsiCo brand, produced over 20 commercials for Mirinda. Shooting took place in New York City, Madrid and Malaga in Spain, and Frankfurt, Germany. 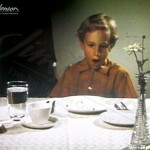 The Henson Associates’ Mirinda commercials aired in several countries, including Spain, Mexico, and West Germany. See the Mirinda Craver in action. 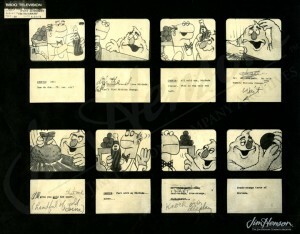 1975 Storyboard for “Grocer” Commercial. Don Sahlin’s early sketch for the Craver, 1975. Dave Goelz’s Craver sketch, 1975. 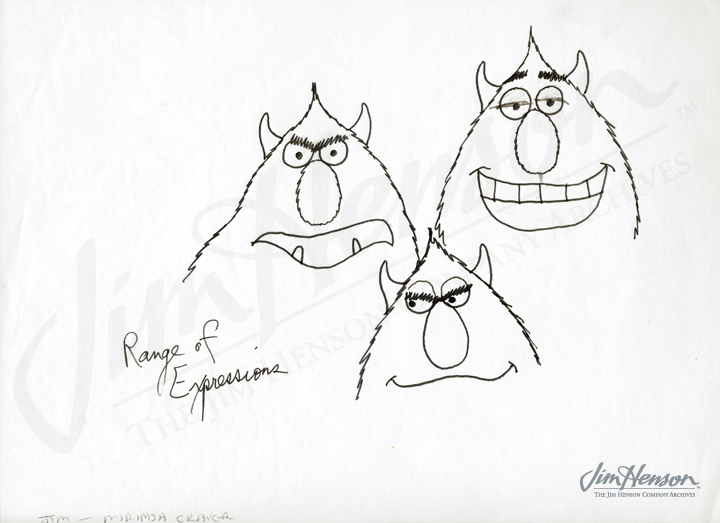 Craver sketch by Jim Henson, likely mid-1975. Shoot for “Beach” commercial, 1978. 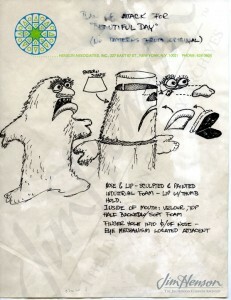 “Beautiful Day” was the name of both a short comedy piece and later the monster that was featured in it. 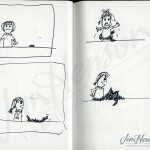 The bit represents a recurring theme in Jim’s work where the meek (yet smart) and/or good prevails, a product of the optimistic world view that Jim shared with his colleague and writing partner Jerry Juhl. Starting in 1962, an innocent little girl was often used to foil the nefarious plans of a monster, witch or generally annoying person. For a series of traffic safety test films created for the National Council of Churches, a pointy-nosed monster named Sneegle tried to corrupt two innocent children (Billy and Sue). In each situation, however, Sneegle was the one that was hurt in an accident. 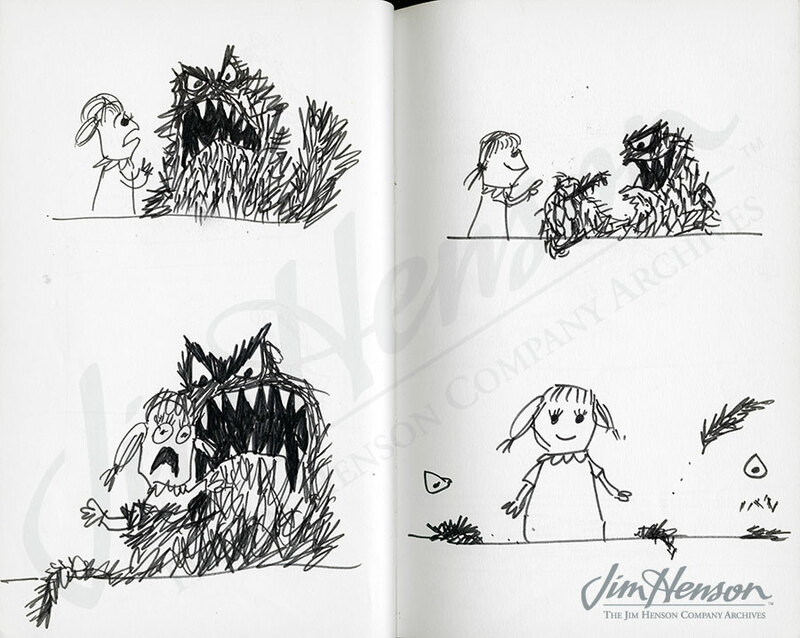 While those films went unused, Jim and Jerry saw the comic potential for the contrasting personalities of the sweet little girl and the monster and wrote what would become a classic for a March 26, 1963 appearance on The Today Show. In the “Beautiful Day” bit, Sue is enjoying the lovely weather. When Sneegle arrives, so does a rain storm, but that doesn’t dampen Sue’s enjoyment of the day. She explains that the rain makes flowers grow, and when Sneegle eats the flower, she enjoys the beauty of the pot. When Sneegle breaks the pot, she scolds him, calling him evil, but then changes tack and tells him, “You’re so evil that it’s beautiful…you are beautifully evil.” This reduces Sneegle to tears, giving Sue the upper hand. 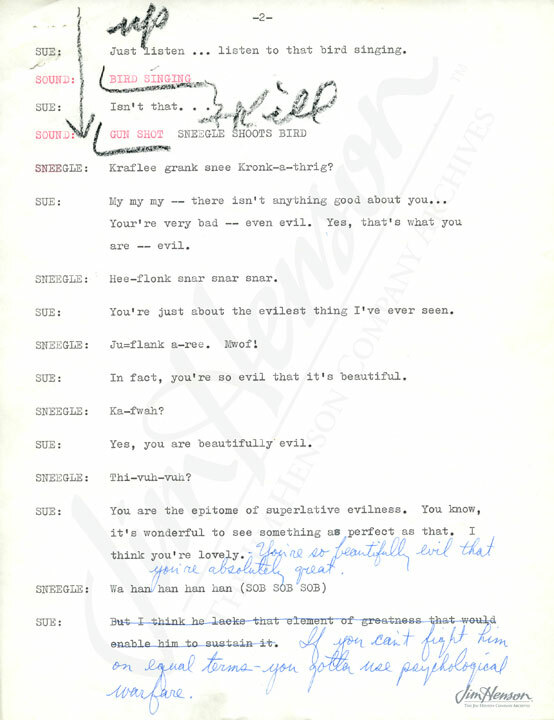 The bit ends with her telling the audience, “If you can’t fight him on equal terms, you gotta use psychological warfare.” About a year and a half later, for a Pak-Nit sales film, Billy and Sue (as Shrinkel and Stretchel) outsmart the witch Taminella, surviving the oven with their wits and positive attitude. 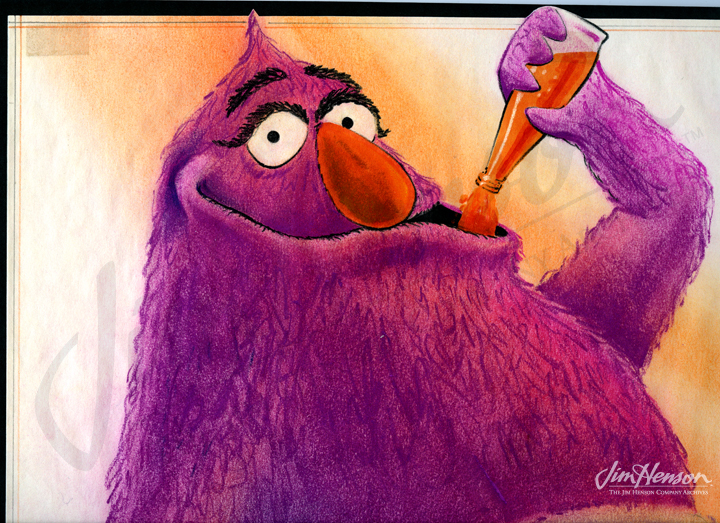 In 1966, Jim and Muppet builder Don Sahlin made some new monsters for a test commercial for General Foods Canada’s snack products, Wheels, Flutes and Crowns. A flat-headed blue monster, the Crown Grabber, would become the monster of choice for “Beautiful Day” and take the title for his name. That summer, Jim did a week of Mike Douglas Shows and pulled out everything in his repertoire, including “Beautiful Day”. 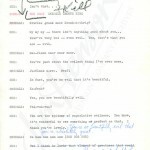 He and Jerry added some business and rewrote the last line, having the girl say at the end, “You’ve got to talk your troubles down to a size where you can handle them.” That was followed by an October 26, 1968 Tonight Show appearance which featured a little girl, now blond, and the Crown Grabber. 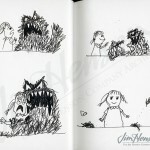 This time, when she talked her troubles down to size, the monster shrank and a mini version was used to end the bit. 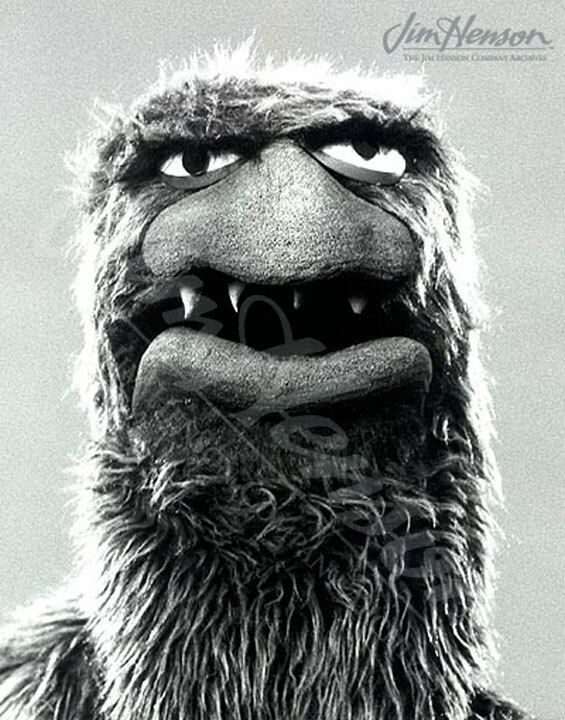 Jim performed the piece again the following year on The Ed Sullivan Show and then Beautiful Day became a utility player on the early seasons of Sesame Street and then The Muppet Show. 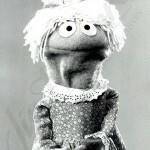 The monster still appears, most recently in The Muppets feature film, and the smart and efficient Prairie Dawn of Sesame Street is a direct descendent of that feisty little girl. See the Crown Grabber in action and two sizes of Beautiful Day helping Kermit explain Big and Little on Sesame Street. 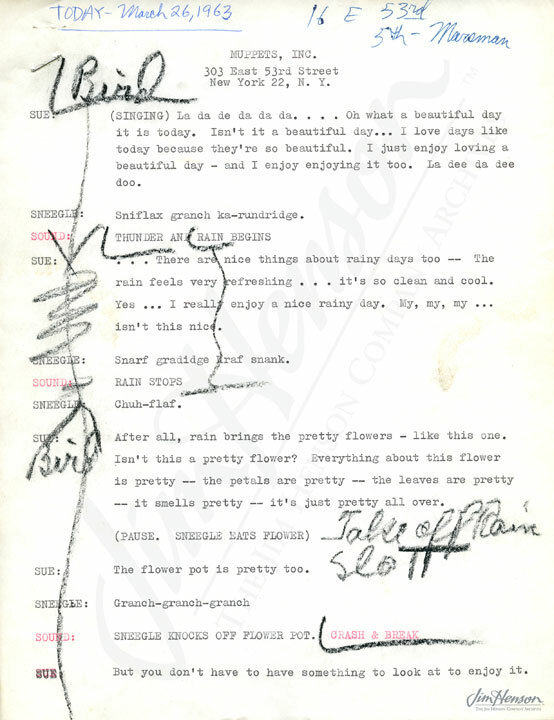 “Beautiful Day” script by Jim and Jerry Juhl for The Today Show, March 26, 1963. Beautiful Day sketch created by John Lovelady when rebuilding the monster for The Muppet Show, 1970s. 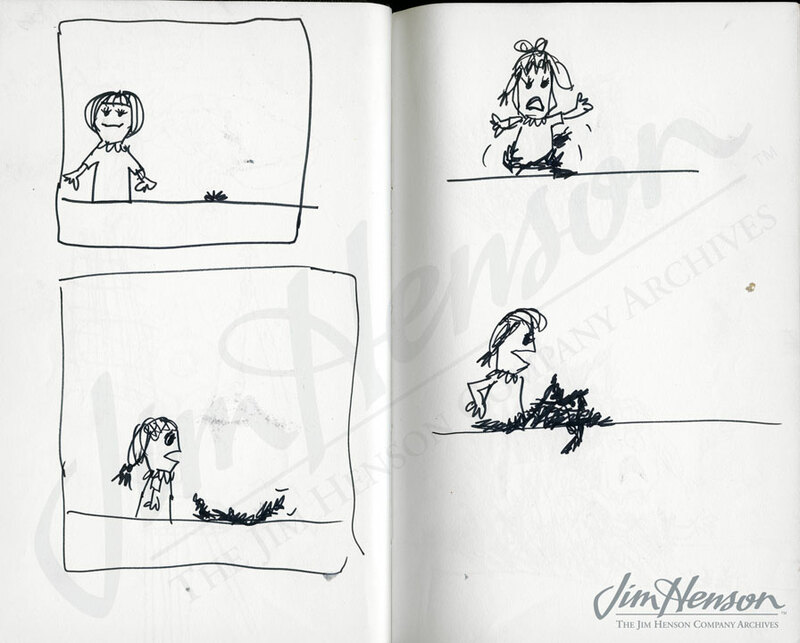 Jim’s idea for a situation in which a little girls bests a monster, late 1960s. 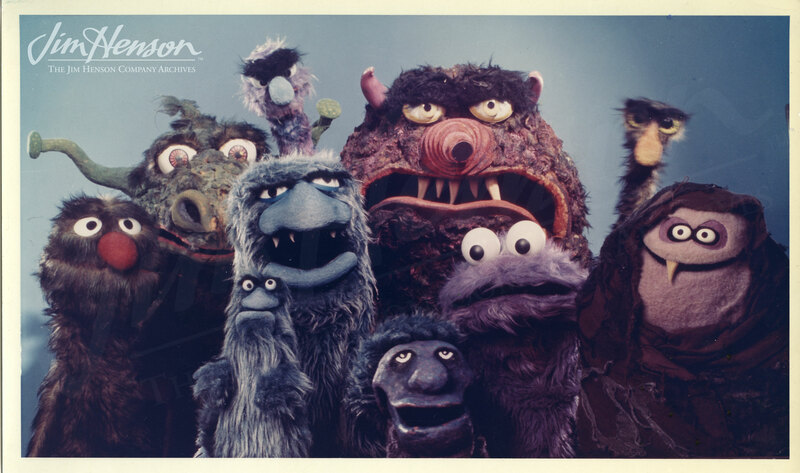 Beautiful Day and other Muppet monsters (and one witch), c. 1969. The Beautiful Day monster and his little girl nemesis (a.k.a. Susie), 1960s.